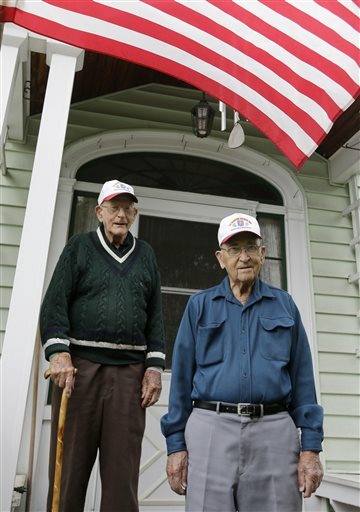 2 NY vets of Edson’s Raiders recall WWII battles. My boys. Thanks to my friend Chris Carola at the AP and Senator Little’s office for recognizing them while they were still with us. “I knew quite a few of those guys,” said West, 93, who made the short drive to Addison’s home 45 miles north of Albany recently to reminisce about their wartime service with the legendary Edson’s Raiders, an elite Marine Corps unit that was the forerunnner of today’s U.S. Special Forces. The document Addison keeps among his wartime mementos and literature lists the names of members of the 1st Marine Raider Battalion who died while fighting the Japanese in the South Pacific. Addison and West are among the dwindling number of Edson’s Raiders still alive. Out of an original roster of about 900 men, fewer than 150 are believed to survive, according to Bruce Burlingham, historian for U.S. Marine Raider Association. Dubbed Edson’s Raiders after their colorful, red-haired commander, Col. Merritt “Red Mike” Edson, the unit was the first U.S. ground force to attack Japan-held territory after Pearl Harbor. Landing on Tulagi in the Solomon Islands in August 1942, they beat the larger 1st Marine Division’s arrival on nearby Guadalcanal by an hour. The 1st and 2nd Raider battalions, formed just days apart in February 1942, were the first commando-style units in the American military, predating the creation of the U.S. Army Rangers by four months. 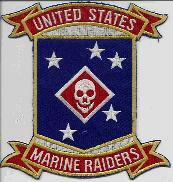 Trained in jungle warfare and hand-to-hand combat, the Raiders’ leatherneck pride paired with a pirate’s attitude was reflected in their distinctive battalion patch: a white death’s head skull in a red diamond, set against a blue background with five white stars representing the Southern Cross constellation. Addison, an Alliance, Ohio, native, and West, who grew up outside Glens Falls, both fought at Tulagi and later on Guadalcanal, where Edson’s Raiders earned their vaunted place in American military lore for anchoring the thinly stretched Marine defenses that decimated Japanese forces during successive nighttime assaults in September 1942. Fighting from positions separated by a few hundred yards along high ground near the island’s airfield, Addison and West helped defend what became known as Bloody Ridge _ but that the Marines called “Edson’s Ridge.” They wouldn’t learn until much later that the fight was considered a turning point that started the U.S. on its island-hopping road to victory in the Pacific. “In combat, you only know what’s going on in your little world,” West said. Edson was awarded the Medal of Honor for his front-line leadership during the battle, during which his Raiders suffered more than 250 killed and wounded. Bigger, bloodier battles awaited, but Edson’s Ridge and the Raiders hold a special place among leathernecks of all generations, according to Beth Crumley, a historian with the U.S. Marine Corps History Division. “Anybody who has taken an interest in the history of the corps, they’re going to know the story about Edson and they’re going to know about the Raiders and know about the Battle of Edson’s Ridge,” she said. After the Raiders’ next campaign on the island of New Georgia in the summer of 1943, Addison and West were sent back to the U.S. Addison was attending college as part of an officers program, and West was in Guam preparing for the invasion of Japan when the war ended. They went their separate ways and didn’t get reacquainted until the early 1960s, when Addison moved to Glens Falls to become athletic director at a new community college. He ran into West at a Sears store where West was working, and they’ve remained close friends ever since. “They were America’s first elite force unit and showed future units like the U.S. Army Special Forces what could be done with a handful of determined, well-trained, well-armed troops against a determined enemy,” said Robert A. Buerlein, co-author of “Our Kind of War: Illustrated Saga of the U.S. Marine Raiders of World War II. 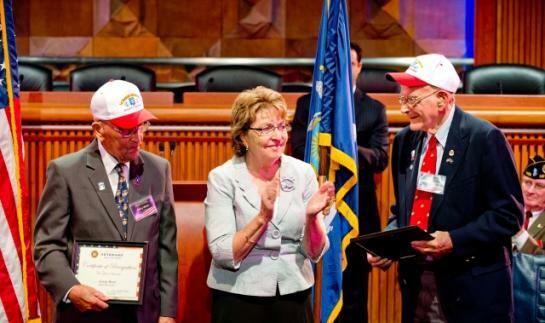 Gerry West and Bob Addison, World War II veterans who served in the same elite U.S. Marines unit and have remained lifelong friends, were inducted into the New York State Senate Veterans Hall of Fame at a ceremony in Albany today. Senator Betty Little nominated Addison of Glens Falls and West of Fort Edward. “These two soldiers were among the first Americans to engage the Japanese in combat less than a year after Pearl Harbor,” said Senator Little. 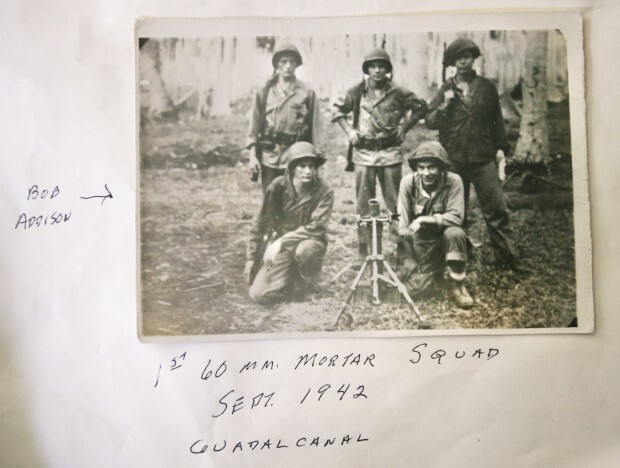 “They were specially selected and trained to serve in the First Marine Raider Battalion, called Edson’s Raiders, and fought in critical and victorious battles on Guadalcanal. On September 14th, 1942, first light at Guadalcanal revealed over a thousand Japanese dead on the ridge. Outnumbered five to one, for two nights the Raiders held on against Japanese shelling by sea and Imperial troops, and the battle became legendary in Marine Corps history. Suppressed from the public at the time, more than 7,000 U.S. Marines, soldiers and sailors would die in the six month Guadalcanal campaign. Japanese losses were much higher. Only a handful of the original Marine Raiders are left. Addison and West survived to return home, marry, and raise children. 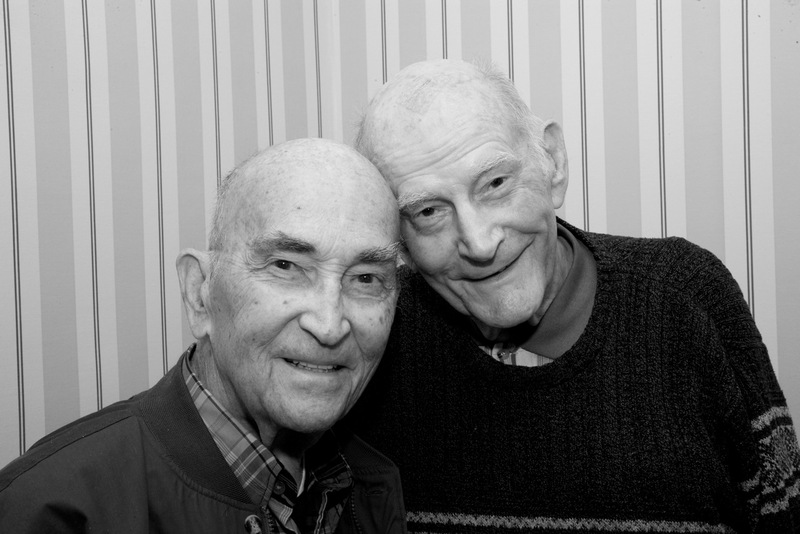 Seventy one years later, their friendship endures. The New York State Veterans’ Hall of Fame was created to honor and recognize outstanding veterans from the Empire State who have distinguished themselves both in military and civilian life. The Hall of Fame can be accessed online at www.nysenate.gov/honoring-our-veterans . Marine Raiders to be honored by NYS Senate. Gerry West and Bob Addison, Spring, 2011. 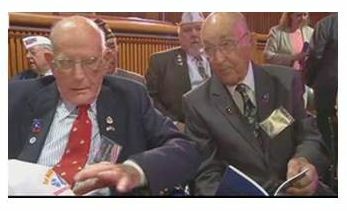 On May 21, 2013, local World War II veterans Gerald West and Robert Addison will be honored in a ceremony for the New York State Senate Veterans’ Hall of Fame. They were nominated by Senator Betty Little at the suggestion of Hudson Falls history teacher Matthew Rozell, whose students had interviewed these men several times. In this installment of an ongoing series, my students and I have pieced together narrative voices of local residents and their friends that show the enthusiasm for the war effort. 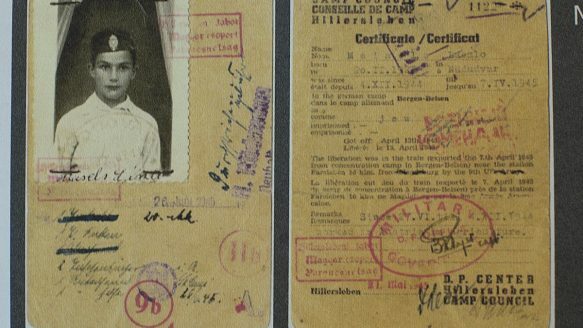 Maybe more importantly, their recollections amplify other points essential to an understanding of World War II, but often overlooked. In the study of this war, we are tempted to both teach and learn the history as if the way things turned out was somehow preordained − as if, from the outset, it was a foregone conclusion the Allies would win the war. Because we know how events turned out, we read the history with a sense of inevitability (as several historians have pointed out). Nothing could be further from the truth. By talking to persons who lived through these troubled times, my students and I gained insight into the urgent, uncertain, confused way many events actually unfolded. We confronted particularly – through the stories of local men and women − the nation’s unpreparedness in the first years of the Pacific War, beginning with the initial limited response to the Japanese attacks at Pearl Harbor, Wake Island, Guam, and the Philippines. While military planners in Washington debated, numbers of local men would fight to survive in vicious jungle fighting. Indeed, it was the incredible actions of these men, against overwhelming odds, which would shape events and force policymakers in Washington, D. C., to take notice. Six months after Pearl Harbor, American naval forces won a decisive engagement at the Battle of Midway (June 4−7, 1942) At this time, advance elements of General Alexander Vandegrift’s 1st Marine Division were gathering in New Zealand, with no American offensive action planned until early 1943. However, soon after Midway, intelligence showed a Japanese air base under construction at Guadalcanal in the Solomon Islands. If finished, the Japanese noose encircling Australia would be complete and any Allied counteroffensive very difficult. A U. S. amphibious landing was needed immediately, and on a scale not attempted since the World War I Allied debacle at Gallipoli (1915) − and with much less time to plan. “I could not believe it,” General Vandegrift would later say of this plan. Vandegrift had within his command a special unit, under formation only since February 1942, the “1st Marine Raider Battalion,” which would play a key role in the ultimate U. S. success at Guadalcanal. Schooled by veterans of Marine operations of the 1920s and 1930s in Central America and China, 900 specially selected young men formed a lightly-armed, mobile commando unit able to operate in sub-equatorial jungle − the vanguard for larger troop landings to follow. Named “Edson’s Raiders” after their Colonel “Red Mike” Edson, the unit would earn combat honors unparalleled in Marine Corps history in 18 weeks of violent engagements at Guadalcanal. Of the 900 original Raiders, two local veterans interviewed by our class belonged to this elite group and currently reside in Senator Little’s 45th Senate District. Addison made the cut and was interviewed by a Marine captain who told him the Raiders would be the cream of the Marine Corps, but also warned their mission would likely be “first in and last out.” Addison accepted the challenge and was assigned to a mortar squad in the fledgling Raiders. More training followed. Some days they marched, fully equipped, dozens of miles in the day, only to turn around and re-navigate the same terrain, in the dark, through swamps and across rivers. The Raiders embarked on a cross-country train journey and were then, for two weeks, carried by reconverted World War I destroyers across the South Pacific to Samoa. There, in conditions of hot, muggy weather and frequent rain, training continued with cross-country hikes in a mountain terrain of steep ridges and slippery trails, often at night. Sometimes pushed from 5:00 A. M. until 10:00 or 12:00 P. M., the men survived on skimpy rations, while also completing a training schedule that included practice landings in inflatable boats, Judo, bayonet combat, first aid, stalking, and demolition. Eight months after Pearl Harbor to the day, the Marines landed in combat. To secure Guadalcanal, the Raiders were assigned to take the neighboring island of Tulagi, where they would be up against the best of the Japanese combat forces, the Rikusentai or Japanese “Special Naval Landing Forces.” Coming in on Higgins Boats in the morning hours of August 7, 1942, the Raiders would clash for three days in vicious fighting, encountering hitherto-unknown Japanese cave bunkers plus their enemies’ sniper actions, night-fighting, and willingness to fight to the death. The Raiders then conducted raids on Japanese camps on Guadalcanal, as enemy forces ere being reinforced at night, every night, while the US Navy left the scene. Addison was trained as a mortar man and West was a demotions expert and tapped as a machine-gunner in the critical battles at Guadalcanal, where the Japanese were developing an airfield to support their attack on Australia. The Marines captured the airfield and the Raiders pulled back to high ground overlooking it to defend it. If the Ridge fell, Guadalcanal would fall; and if the ‘Canal fell, Australia might be next. A vicious battle for the high ground would ensue. On September 14th, 1942, first light at Guadalcanal revealed over a thousand Japanese dead on the ridge. Outnumbered five to one, for two nights the Raiders held on against Japanese shelling by sea and Imperial troops, and the battle has become legendary in Marine Corps history. Battle of Edson’s Ridge Painting by USMC artist who was at Guadalcanal. Suppressed from the public at the time, more than 7000 U.S. Marines, soldiers and sailors would die in the six month Guadalcanal campaign. Japanese losses were much higher. By the time the last starving and dispirited Japanese troops left in Feb. 1943, further Japanese expansion into the South Pacific was halted. Condensed from the forthcoming Washington County Historical Society Journal. The Washington County Historical Society Journal is an annual 96 page print publication of the WCHS. The Journal seeks to publish new research into any aspect of the County’s history, and this includes reminiscences and interesting unpublished source materials. All members of the WCHS receive it; for membership information, please visit their website at www.wchs-ny.org. William Manchester, Goodbye, Darkness: A Memoir of the Pacific War (Boston: Little Brown, 1987) p. 167. Geoffrey C. Ward & Ken Burns, The War: An Intimate History (NYC: Knopf, 2007) pp. 47−49. Among them, 24 U. S. Navy ships would be named in honor of individual members of the Battalion before the war was over. See Col. Joseph H. Alexander, Edson’s Raiders: The First Marine Raider Battalion in World War II (Annapolis: Naval Institute Press, 2000) p. 49. Merritt “Red Mike” Edson was born just over the border from Washington Co. in Rutland, VT, in 1897. Retiring as a USMC Brigadier General, he returned to Vermont and became the first Commissioner of the Vermont State Police. ALBANY, N.Y. — The souls who carry heavy memories from war were thanked in Albany on Tuesday for bearing the burden of our freedom. Craig enlisted when he was 17-years-old. Fifty-four men and women have been added to the New York State Senate Veterans’ Hall of Fame for what they’ve done and kept doing over the years. These men and women’s lives would then never be the same. Among them are Capt. Gerry West and Sgt. Robert Addison, who both served in the United States Marine Corp. during World War II. The two were part of the Edson’s Raiders, the original 900 members of a commando unit, and survived the battles of the Pacific Theater after Pearl Harbor. “The bloody ridge on Guadalcanal. We were both there. 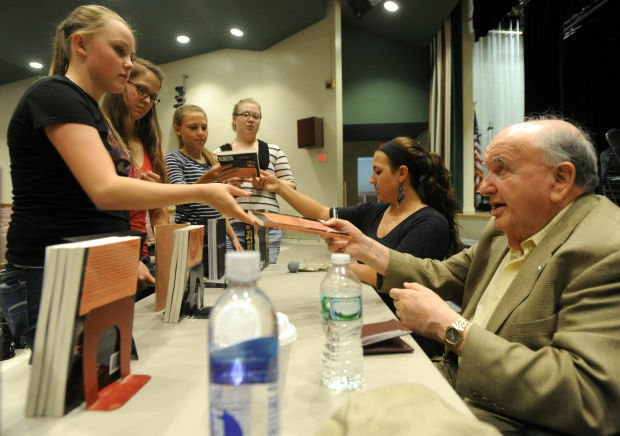 It brings back a lot of memories,” said Addison, who now lives in Glens Falls. West resides in Fort Edward now. “We’ve known each other for 71 years. Since February of ’42, so what would that be? 71 years,” he confirmed. Now neighbors in the North Country, the two Edson’s Raiders are still right by each others’ side. “Well, I just live down the road from him, so we’ve kept in touch all the time,” said Addison. These legacies are once again being remembered and passed onto the younger generation. For more information on the Veterans’ Hall of Fame, visit www.nysenate.gov . In 1986 I traveled to the Soviet Union with a group of teachers. I was pre-service, but wanted the experience of traveling to Russia. We flew into Moscow, toured a few days, then took the night train to Leningrad. It was April, it was beautiful. People were in a festive mood on the tour bus. And next to them, Red Army soldiers. But know this, those who regard these stones:No one is forgotten, nothing is forgotten. So in the month of May, Remembrance Month in my eyes.